LERWICK, Shetland Islands, UK, September 27, 2010 (ENS) – On Saturday, Greenpeace UK activists were forced to remove the yellow survival pod they had attached to the anchor chain of a Chevron-operated drill ship a mile off Shetland in Bressay Sound. A Edinburgh court Friday granted the oil giant an injunction to remove the Greenpeace campaigners, who had equipped the pod for a month-long occupation. Chevron’s lawyers argued successfully that the pod hanging on the Stena Carron’s anchor chain was “a risk to the vessel,” because it would have prevented deployment of the anchor chain if the drill ship’s thrusters were to fail. The eight thrusters on the drill ship keep the vessel within one meter of any designated spot, so that it can drive a drill into the sea floor and search for oil without the ship moving. Greenpeace contends that if the thrusters were to fail in rough seas with a drill stuck in the seabed, the UK could be facing a catastrophic oil spill like the BP/Deepwater Horizon spill in the Gulf of Mexico that leaked 4.9 million barrels of crude oil over 87 days until it was capped July 15. The activists conducted the Stena Carron action to press their point that deepwater oil drilling is dangerous for the environment and the world needs to move beyond oil to cleaner sources of energy. Hours after Greenpeace took the survival pod from the ship’s anchor chain, it left for a site in the Lagavulin oil field, a deep water drilling site off Scotland, where it will drill an exploratory well. 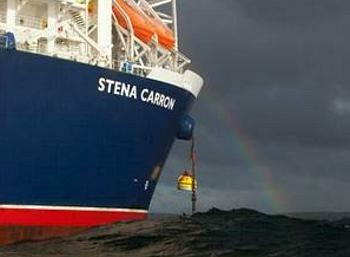 On Saturday, Greenpeace sent out an action team in inflatable speedboats to track the Stena Carron. In open seas 100 miles north of Shetland, the organization put four swimmers wearing drysuits in the drill ship’s path, forcing it to stop. “We need to go beyond oil, we need our politicians to stop ships like this from threatening our pristine coastlines and the global climate,” said Stewart. “It shouldn’t be down to people bobbing in the water in front of ships to stop the insane rush for the last drops of oil in ever more dangerous and difficult to reach places,” Stewart said. Greenpeace now is planning to send waves of swimmers and campaigners in kayaks out in front of the drill ship to pressure Chevron into turning the ship around. Greenpeace is threatening legal action against the Cameron Government in an effort to stop the granting of new permits for deep water drilling off the UK. Last month Greenpeace lawyers wrote a letter before action to ministers – the precursor to seeking a judicial review of the decision to push ahead with new deep water drilling before lessons from the BP disaster have been learned. At the end of August, Greenpeace activists from the Esperanza on the same mission – to stop deepwater oil drilling – scaled another Stena drill rig, the Stena Don in the North Sea. They suspended themselves in platform tents from the underside of the rig for two days before the bitter weather drove them out. The climber ascended to the rig platform September 2 where they were taken into custody and transported to Greenland.